It’s the #DCTV Couch Club Arrow writer swinging by the Supergirl universe again. I covered an episode of Supergirl earlier this season and was asked to check out tonight’s and jot down my thoughts. Since I don’t watch the show regularly, I got lucky last time with an episode that was a nice little contained story with Supergirl battling and defeating the bank-robbing villain, Psi. 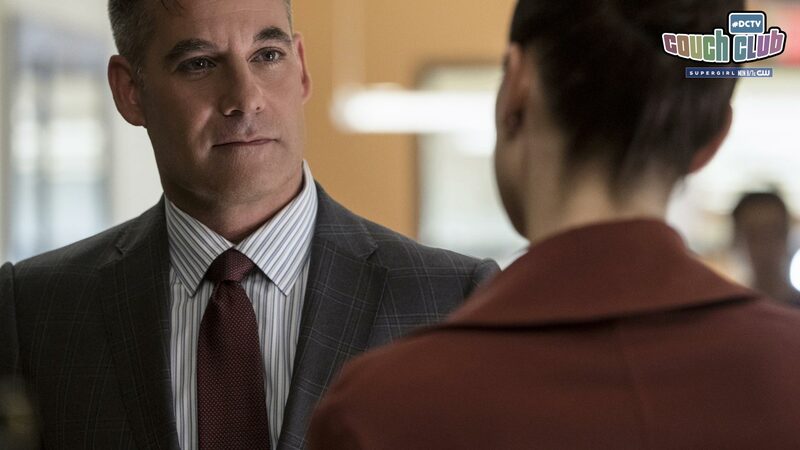 There’s clearly a running storyline connecting Lena and Morgan Edge (more on him in a bit). Thankfully, I was able to largely gather what’s been going on and it made for an enjoyable watch. Kudos to the writers who have done a good job of taking multiple characters and intertwining them in the show’s overall plot, while still keeping the storytelling simple and straightforward—it’s not overly complicated or hard to follow—which helps casual or new viewers jump on, but also makes for a stronger show all around by avoiding too much detail that can muddle things up. I thought Alex and Maggie’s breakup went surprisingly smoothly. Maybe too smoothly. Really? No hard feelings on either side? As someone who’s pretty much brand new to the show, I obviously don’t have the emotional investment in their bond that long-time fans have, but it seemed like both still cared for one another a great deal. No room for a compromise? Perhaps that’s what makes it so difficult—both people love each other, but can’t be together because one wants something the other doesn’t. The highlight of the episode for me was easily Morgan Edge. Earlier this season, Meg Downey wrote a little bit about Edge’s comic book background, but I think it’s worth diving a little deeper because he’s a pretty cool character. Debuting in SUPERMAN’S PAL, JIMMY OLSEN #133 back in October, 1970, Edge was created by comics great, Jack Kirby, and explored the idea of crime operating within corporate America. Like a lot of characters over time, there have been changes to Edge, but for the most part, he’s always remained a powerful media tycoon with connections to various criminal organizations—often causing an annoyance for Superman. Edge is about as close to a legit “heel” (bad guy in pro wrestling) as you can get: self-centered, overly confident, believes he’s smarter than, and therefore, above everyone. If you’re anything like me, you probably appreciate a bad guy like this. They’re always more interesting than the hero and they can bring the bad guy heat, while making you laugh at the same time. Tonight proved just that. I was more interested in what Edge was doing or planning and what he was going to say next than I was in anything Supergirl or the other characters were doing. The guy is aces for the show. I mean, there’s nothing more heel than getting on a teleprompter and cutting a promo on someone by using the misfortune of others as a way to elevate yourself. We saw Edge do this exact thing tonight when he went on TV and played the “concerned citizen” visiting the sick kids at the hospital as a way to say Lena was responsible for the lead poisoning. What’s even better than that? We later find out that Edge is responsible for poisoning the kids by dumping the chemical compound in the pool as a way to crush Lena and her empire by making her appear to be the responsible party in the public’s eye. Don’t forget the massive ego—talking down to Lena and Supergirl when they confront him and being super pretentious because he knows he’s untouchable at this point. In fact, the only thing that would make him better is if when he’s finally exposed, he completely cowers and pleads for mercy and so forth. That’s the proper way to act when you’re a slimy bad guy. OH! And keep the bad haircut, too. Thanks for letting me step into your world again, Supergirl fans!